This off the beaten track gravel pass has plenty to offer including strictly single width, rugged and dramatic scenery and an awesome campsite at the foot of the pass. Best of all it's a cul-de-sac. You can read up all about the history, built when men were real men and passes were built with pick and shovel. The news release also has lots of other interesting bits and pieces. As usual the featured pass remains open to Wild Dogs members for the next week. Enjoy! Thanks Trygve, great stuff as always and this one really sounds like a good one with you mentioning low range and all! Getting there: As this pass is a dead-end, there is only one way to get there. 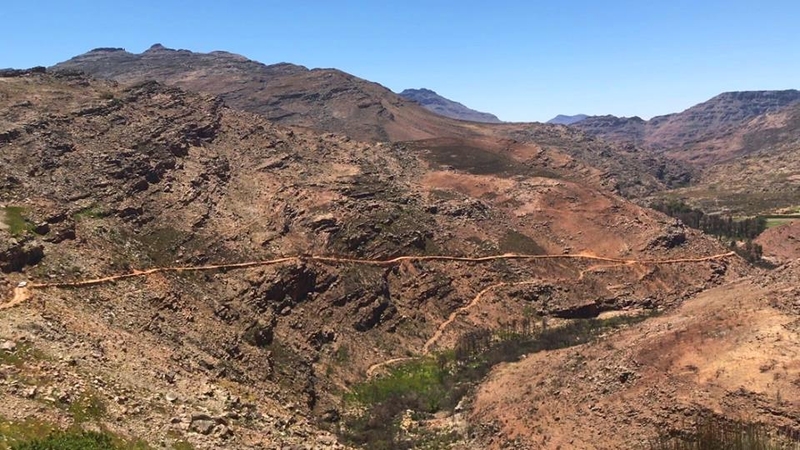 Head along the R303 from Ceres via the Gydo Pass and the hamlet of Op die Berg. From Op die Berg continue northwards on the R303 for 30 km and turn right (east) at the sign marked "Tandfontein" at GPS S32.776837 E19.242297. The road is closed by a boom at this intersection. There is a guard hut on the left which is permanently manned. I have been in touch with the farm owner and at this stage they don't allow motorcycles or quad bikes. Pity!